Channel's Hatred Indicates Radha to Join Janasena? Vangaveeti Radha's resignation to YSRCP triggered a sort of sensation among political circles. Hitherto, it was buzzed that Radha would join Power Star Pawan Kalyan led Janasena. However, Radha has never spilled beans. Right away Radha tendered his resignation to the party and sent it to YS Jagan Mohan Reddy, pro TDP's yellow media houses got energized and joined their duty to script a strategy to get peoples' mindsets diverted. Appropriately, TDP put the proposal to Radha to join TDP so that he would be offered an MLC seat. In fact, Radha has aspired to contest from Vijayawada central. As the seat was denied by YSRCP, he had to got his candidature resigned to the party. Meanwhile, an yellow channel CBN Chandrajyothi (name changed) spread the gossip that Radha okayed TDP's offer and would join the party on 24th of this month. However, within no time, these gossips were rubbished by close sources of Radha. And today, a merugaina caste samajam channel in its 'Political Bajji' programme spewed venom on Janasena by cooking up a story . The channel's report says, Radha would join either the Congress party or Janasena as both the parties would be supporting to TDP for upcoming general elections. "This is said to be the conspiracy of TDP and caste biased merugaina samajam channel. As a matter of fact, TDP confirmed Vijayawada central ticket to sitting MLA Bonda Uma long ago. As such, the party wouldn't extend its support to Radha in spite of he would join either Congress or Janasena. 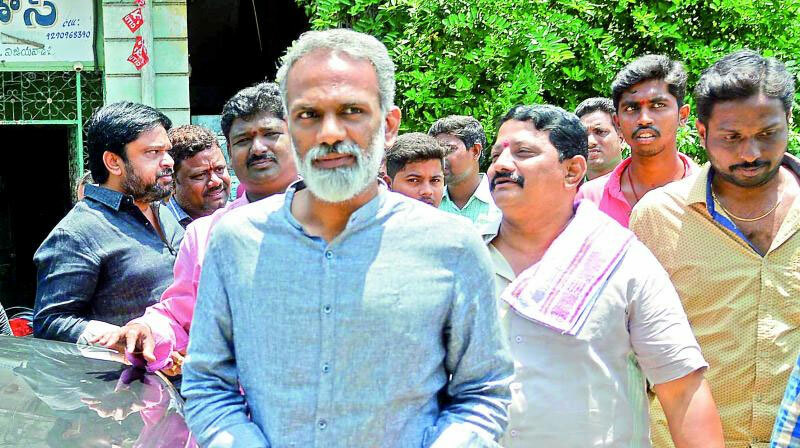 As such, both TDP and merugaina samajam channel have decided to indulge in Goebbels propanda that Radha would join Janasena in connection with the alliance between Janasena and TDP," says a political source. "If at all some key leaders of TDP join Janasena, TDP's useless conspiracies against Janasena would go futile," added the source. "The channel's hasty hatred on Janasna also indicates that Radha would join Janasena soon. But Janasena will not go for alliance with TDP even in dreams," clarifies the source.